This show also plays at 11:45am on Thursday, March 14, 2019. So much science, so little time. 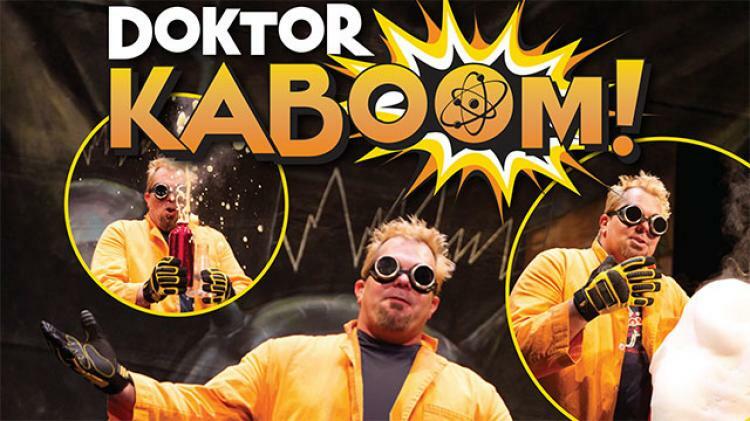 . . Doktor Kaboom is having trouble picking his favorite science demonstrations, so he’s bringing them all! Unfortunately there are way too many to do them all in one show. The solution: The Wheel of Science! Doktor Kaboom has built a great big spinning wheel and labeled it with everything from optical illusions to chemical reactions to a homemade hovercraft, and more! At least a dozen fantastic demonstrations ready to go. Wherever the wheel stops, that’s what’s next! Will we turn a water bottle into a rocket or catapult bananas across the stage? Electrocute a pickle or create artificial gravity? Who knows? No two shows will be the same. So, step right up, and let’s spin that wheel!